How do you live with more joy and less struggle? How do you avoid the pitfalls that stop you in your tracks? 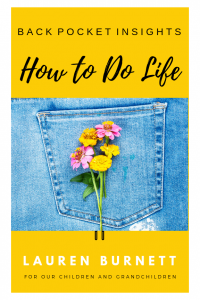 Navigation through life’s corkscrew adventure can seem a bewildering process, but there are many ways to face the challenges and as a result feel happier, clearer and that your life matters. Motivated by her desire to share what she wished she’d known earlier in life and informed by the incomparable work of minister, author and international lecturer, Dr. Edna Lister, Lauren Burnett realized we need to be better prepared for how to do life.Now in this young adult book, Back Pocket Insights on How to Do Life, Lauren Burnett shares personal stories and insights on how to be and give your best, deepen relationships and navigate life with God on your side. Arrange for author visit and program using “insights” from Back Pocket Insights on How to Do Life for discussion and for author reading. 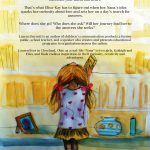 Inspire creativity, determination and bonding between generations with imaginative text, beautiful watercolor illustrations and uplifting songs as you follow the adventures of Nana and Elisa-Kay in our Nana Says Book Collection. One day this super-cool, creative idea just pops into Elisa-Kay’s mind. 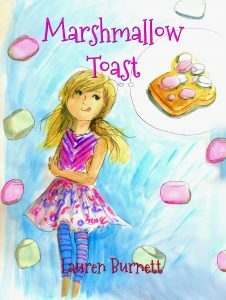 She is so excited to give it a try – the only problem is her friends and family don’t share her enthusiasm and even think her idea is just plain weird. 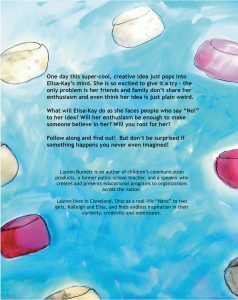 What will Elisa-Kay do as she faces people who say “No!” to her idea? Will her enthusiasm be enough to make someone believe in her? Will you root for her? Follow along and find out! But don’t be surprised if something happens you never even imagined! Click on BUY button to see ALL THREE books in ALL FORMATS on Amazon. $9.41 for Soft cover is reflected on Amazon. Elisa-Kay’s favorite place in the whole wide world is her family’s summer cottage. It’s on a lake so clear you can see the bottom, and it’s a wonderful, fun place where she and her cousins have many exciting adventures. 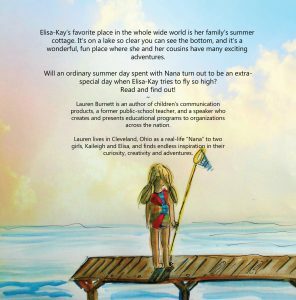 Will an ordinary summer day spent with Nana turn out to be an extra-special day when Elisa-Kay tries to fly so high? Click on BUY button to see all formats of ALL THREE books on Amazon. $9.41 for Soft cover is reflected on Amazon. I cried after I read “Fly So High”. It reminded me of my own children’s wonderful relationship with my parents when they were growing up. 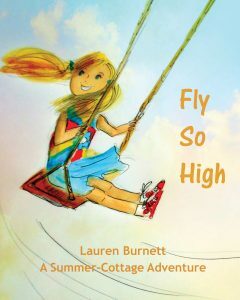 I loved this book as an educator, parent and grandparent, and can’t wait to read more books written by Lauren Burnett. — Laura Crossland, mom, grandmother and teacher. What would you do if you had a BIG question – a question that stretches your mind and heart – an important question? 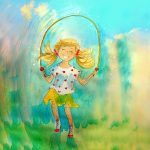 That’s what happens to Elisa-Kay when her Nana presents an idea that sparks her curiosity about loving and sets her on a day’s search for answers. Where does she go? Who does she ask? Will her journey lead to the answers she seeks? Click on BUY button to see all formats for ALL THREE books on Amazon. $9.41 for Soft cover is reflected on Amazon.